It has been said that when a man marries a woman he marries her family too. Less well-recognized is the fact that with her family comes her family’s culture. What that has meant for me, perhaps more visibly than anything else, is our annual celebration of the “Wigilia” – Polish Culture’s Christmas Eve tradition. The word “Wigilia” – pronounced “vi’ɡilja” (“veegeelya”) in Polish – translates alternatively as “vigil” or “eve.” Traditionally, the Wigilia starts on Christmas Eve day with the trimming of the Christmas tree and readying of the house. 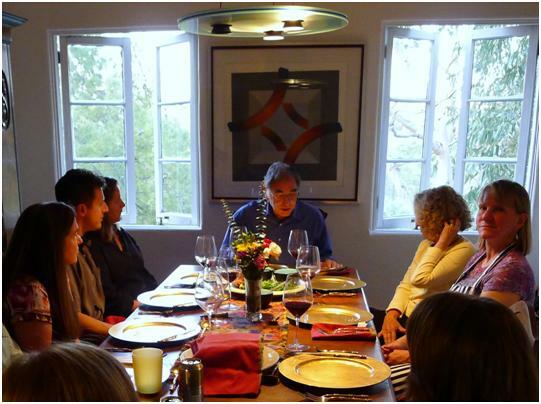 One unique ritual – which Nancy’s family did not adopt – was placing a dash of hay on the table to be topped by a plain white tablecloth. With the house readied, the children of the family stand watch for the appearance of the first star in the sky. Another Wigilia tradition – one which echoes the place set for Elijah at the Jewish Passover Sedar — is to leave one extra place-setting for an unexpected guest. The empty seat is left open just in case a traveler, family member, or a friend knocks on the door, insuring that there would be a place for them to join in the celebrations. The central element of Wigilia is a twelve course dinner – classically, pescatarian — the number of dishes symbolizing both the months of the year and the twelve apostles. In Nancy’s family the meatless tradition gave way to the seductive charms of the Golabkis – pronounced “ɡɔˈwɔmpki” (“gawoompky”) in Polish – cabbage rolls stuffed with ground meat and baked with tomatoes. For Nancy’s family, the menu revolved around three main items: the Golabkis as the main course (or, in more indulgent affairs, as an additional intermediate course prefatory to a main course involving a large bird), an appetizer course featuring two types of Pierogis (potato and cheese, on the one hand, and sauerkraut and boletus mushrooms, on the other), preceded by a borscht (soup), usually based on boletus mushroom but sometimes the beet borscht with which Americans would be most familiar. These are the parameters with which we work almost every year. Much like our tailgates, our Wigilias are more in the nature of variations on a theme than they are ritual incantations of traditional recipes handed down by generations to the point of worship. Rather, each year they we look for ways to find more in those traditions. This year was no exception. Nancy’s Aunt, Stasia, was the family member traditionally responsible for the soup course. Her specialty was Mushroom Borscht. Stasia would make a classic mushroom soup, liberally featuring boletus mushrooms – a close relative of porcinis – which she finished with more than a dash of heavy cream. It was a heady concoction that went down well in the cold New England nights. For our soup course we decided to nod both to Stasia’s original and to the sort of Borscht with which many might be familiar: beet borscht. 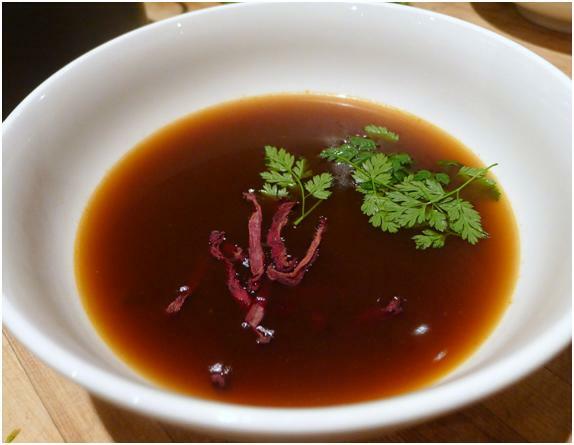 We made a rich mushroom soup – featuring loads of dried Porcini mushrooms – before clarifying it and serving it with homemade beet strips and chervil. Make the Beet Strips. The day before serving, peel and thinly slice the beets about 1/8 of an inch thick. Julienne the beet slices (cut them in even strips). Place the julienned beets in a dehydrator at approximately 140° Fahrenheit overnight. Check the next morning. The strips should be dry but not hard. If necessary, dehydrate longer. Make the Mushroom Soup. Sweat the onion, leeks, carrots, celery and fennel in a soup pot for five minutes. Add the bay leaf and the tomatoes and cook for five more minutes. Add the mushrooms and eight cups of water and bring to a boil. Reduce to a simmer and cook for three hours. Cool the stock over night. Clarify the Consomme. The next day, to clarify the soup lightly whip the egg whites and season well with the kosher salt. Whip this concoction into the cold stock and place over a medium heat. Bring the liquid up to the point just before a boil, making sure the bottom doesn’t burn (stirring occasionally). As the proteins in the egg white coagulate a “raft” will appear on the surface. Don’t worry: you’ll know it when you see it. As this starts to happen, stop stirring and leave to simmer very gently for about half an hour breaking the surface of the raft as necessary to allow some of the pressure to escape. Do not allow the soup to boil at this stage. Serve the Soup. Pour a cup of soup in each bowl. Garnish with about equal areas of beet strips and chervil. Of all of our dishes at this year’s Wigilia, the closest to the traditional were our Pierogis. The main innovation was not in the flavors but rather in the technique. Instead of rolling the Pierogi dough out by hand we used our pasta machine and treated it like raviolis. 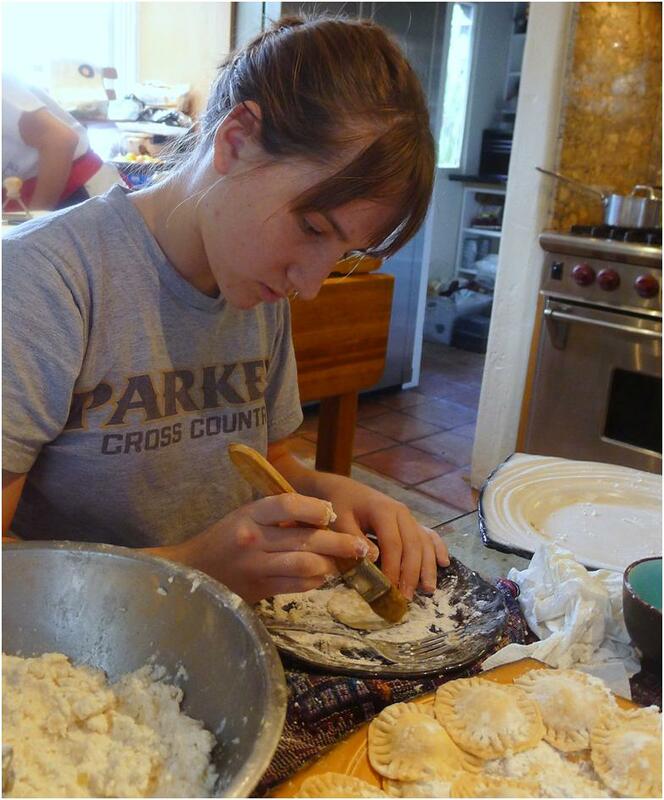 Make the Pierogi Dough. In the bowl of a standing mixer fitted with its dough hook, mix the Pierogi Dough ingredients and knead into a smooth, soft dough. Divide the total amount of dough into two bowls, wrap in plastic wrap and refrigerate for an hour. Afterwards, stretch the balls of dough out using a rolling pin (or pasta machine) to a thickness of less then 1/16 of an inch (on a pasta machine, take it to its last notch). Using ring molds, ravioli cutters or cookie cutters, cut the pierogi dough into desired shapes (remembering that you will need two per pierogi, one for the base and one for the top). 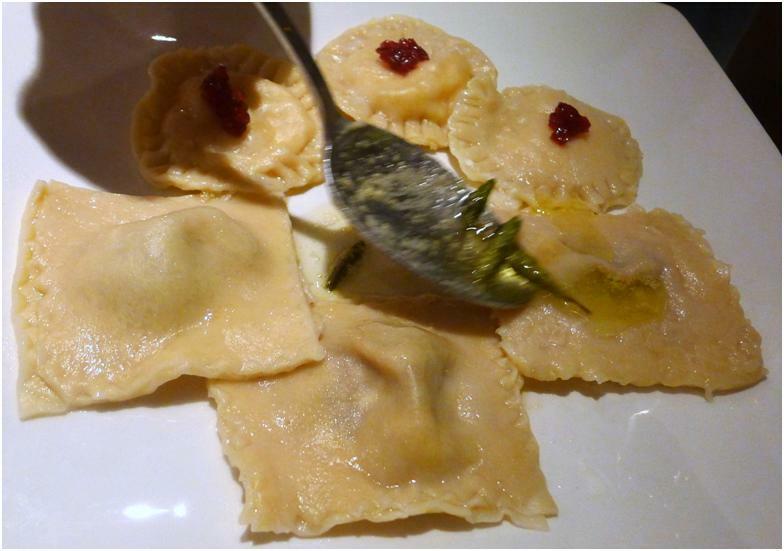 We use different shapes for different fillings: round for the Potato-Cheese, square for the Sauerkraut-Porcini. Make the Potato-Cheese Filling. Put the potatoes in a medium pot and add just enough cold, salted water to cover them. Bring to a boil and cook until the potatoes are soft, about 20 minutes. While the potatoes cook, melt the butter and extra virgin olive oil over medium heat in a large sauté pan. Add the onion and thyme, cooking until the onion turns translucent, about 2 minutes. Lower the heat and continue cooking until onions caramelize slightly, about 20 minutes. You may need to add a bit more butter as the onion cooks. Season with salt and pepper, add the nutmeg, mix thoroughly and set aside to cool. When the potatoes are soft, drain them in a colander and lightly press out the remaining moisture. Return them to the pot, remove from heat and add the cooled onion mixture and the cheese. Mash them just until blended and large lumps are gone. Season again with salt and pepper to taste. Make the Sauerkraut-Porcini Filling. Place sauerkraut in a large sauté pan and cook for 20 minutes. Drain the porcini mushrooms, add them to the pan and sauté for 3 minutes. Return the sauerkraut to the pan, season with salt and pepper and continue to sauté until the sauerkraut turns golden, about 20 minutes. Remove from heat. Make the Pierogi. Place a teaspoon of filling in the center of one of the pieces of cut pierogi dough. Moisten the perimeter with water (or egg yolk). Top that piece of pierogi dough and filling with another of the same shape and seal, crimping the edges with the tines of a fork. Repeat for the rest of the pierogi. As you finish a dumpling place it on a hotel pan covered with wax paper and sprinkle with all purpose flour. Cook the Pierogi. Boil the pierogies a few at a time in a large pot of water. They are done when they float to the top (about 8-10 minutes). Make the Sage Butter. Melt the butter in a medium sized sauté pan and continue cooking until golden brown color appears in the thinnest liquid of the butter. Add sage leaves and remove from heat. Add lemon juice and set aside. Plate the Dish. Arrange three of each type of pierogi on a plate. Garnish each of the Potato-Cheese Pierogi with a bit of the Lingonberry Jam. Garnish each of the Sauerkraut-Porcini Pierogi with a sage leaf and spoon some of the Sage Butter over each of the Pierogi, allowing the butter to pool in the center of the plate. Golabki are the classic Polish cabbage roll dish, made from lightly boiled cabbage leaves wrapped around ground pork or beef, chopped onions, and rice or barley baked in a tomato element, either a sauce or diced tomatoes. In place of the more classic meats we chose to grind our own duck legs. With duck in the picture we decided to play on the natural affinity between duck and orange by making a tomato duck sauce. And instead of the traditional cabbage leaves we opted for one of cabbage’s somewhat more sophisticated cousins, Lacinato Kale. In view of the small size of the kale leaves, our paradigm was Dolmas – stuffed grape leaves – as much as Golabkis. Make the Pickles. Place the carrots and shallots slices in a glass or non-reactive bowl and cover with boiling water for one minute before draining. Place the remaining ingredients in another large glass or non-reactive bowl and whisk to combine the solids and the vinegar. Add the drained vegetables to the bowl and let stand for one to two hours. Store in a refrigerator. Make the Duck Golabki Filling. Sweat the onion, carrot and celery in the olive oil in a large sauté pan over low heat. Turn the flame to high, add the duck and season with salt and pepper. When the duck has browned add the rice and cook to heat through. Make the Tomato Orange Sauce. Quarter the tomatoes and roast them in a 350° Fahrenheit oven until they begin to caramelize, about 30 minutes. Meanwhile, sweat the onion, carrot and fennel in the olive oil in a large saucepan over low heat. 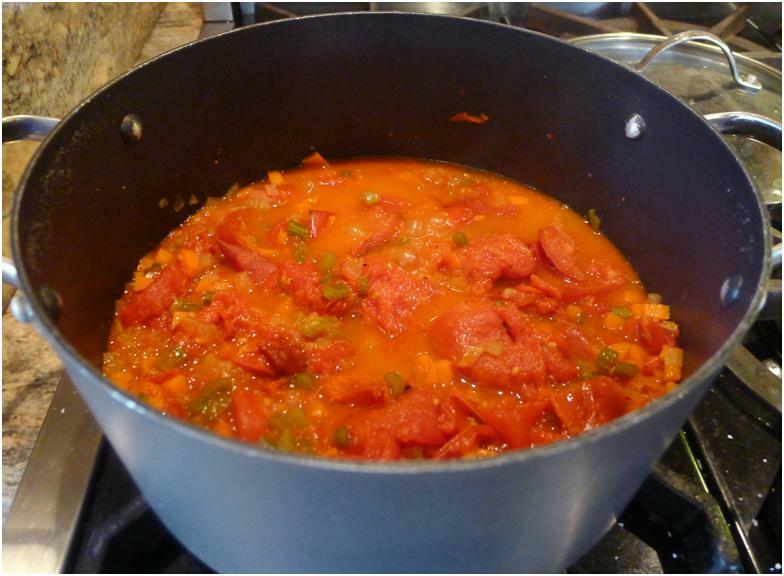 Add both the roast and diced tomatoes to the saucepan, season with salt and pepper and cook over low heat for 15 minutes. Add the orange juice, bring to a boil, reduce the heat and simmer for at least half an hour. Using a Vitamix, other high-speed blender, food processor or immersion blender, puree the sauce to the highest level of refinement you can achieve. Fabricate the Golabki. Prepare the kale for blanching by cutting out the larger portions of the center vein. Blanch the kale for approximately 1 minute in boiling water and then plunge into an ice bath. Working on a large plate or cutting board, place one to three pieces of kale to form a rectangle of about 2 inches by 4 inches. 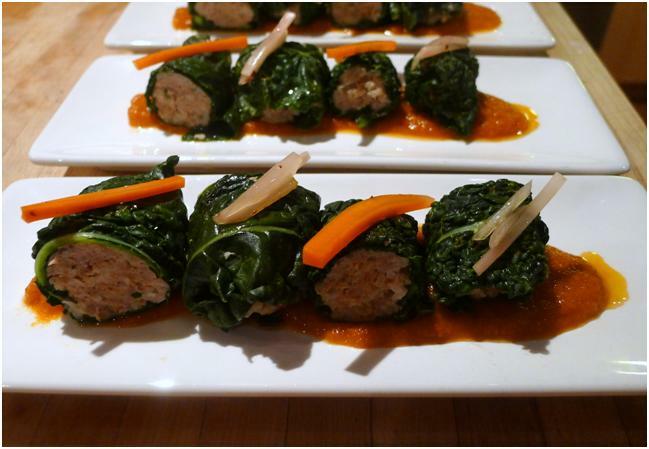 Place about a tablespoon of the filling in the bottom third of the kale rectangle and roll, dolma-style. 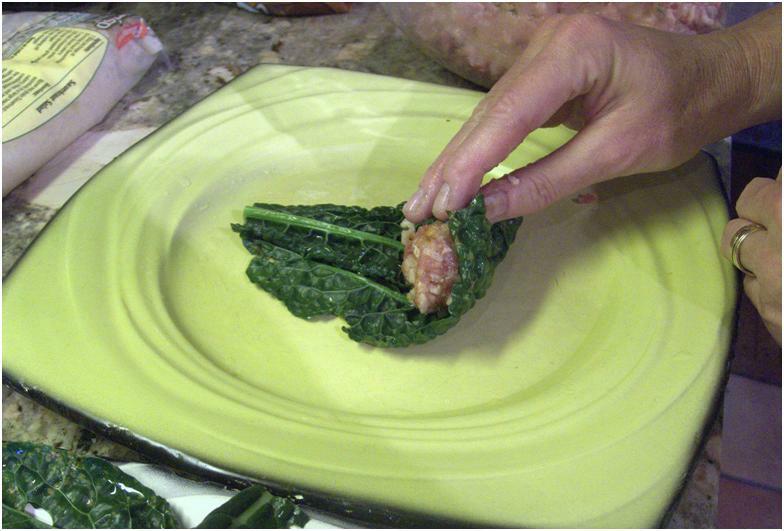 Starting with the bottom of the kale rectangle, fold the bottom toward the center over the filling. Next, fold the two sides of the kale toward the center. Holding the two sides with your fingers, continue rolling it on to itself. As the Golabki are rolled place them in a steamer basket over some additional pieces of kale. 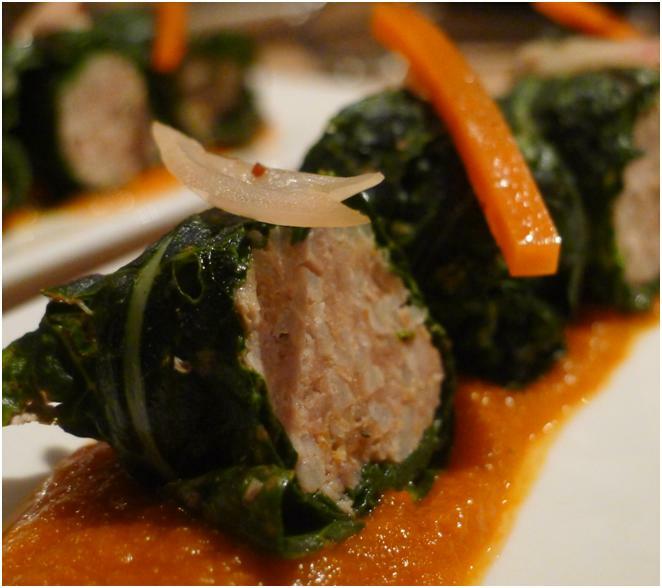 Continue rolling the Golabki until all of the kale is utilized. Cook the Golabki. Bring at least two cups of water to a boil in the bottom of the steamer. Working in batches, steam the Golabki for 15 to 20 minutes, until the meat is cooked through. Plate the Dish. Slice the Golabki in half, horizontally. Spoon some of the sauce on the bottom of a plate in a long pool. Arrange four of the half-Golabki on a plate in a line, width-wise over the sauce. Garnish each Golabki with some of the pickled carrot and shallots, alternating. Bravo! Thanks for this real mouth-watering blog and for sharing recipes too! It is nice knowing the richness of their tradition goes literally to the table during Christmas Eve. Is dessert included in their tewlve course dinner? Hope to see its recipe too.